When Kobo and the American Bookseller Association announced back in August that they had struck an affiliate deal, it was pretty much a foregone conclusion that many of the more ebook-friendly ABA members would sign up. So it should come as no surprise that Powell's Books of Portland, Oregon has announced on their site that they too will sell Kobo ebooks. The announcement seems to have been posted to the Powell's Books website a couple weeks ago, but it only showed up in my search alert today. The image at right is pretty much the sum of the announcement. There's no info on when or how Powell's will sell Kobo's hardware and content, though it does seem likely that the ereaders will be available in all 6 Powell's stores. As for the ebooks, I know of at least one other ABA member who is simply acting as an affiliate, not selling ebooks directly. Titcomb's Books is located in Mass, so I likely won't ever be buying anything from them directly, but the contents of their website suggests that they will stay an affiliate and not act directly as Kobo's agent. Even though today's news could easily have been foreseen, it still marks a milestone for Kobo. Powell's was one of Google's flagship partners when the Google eBookstore was officially announced. 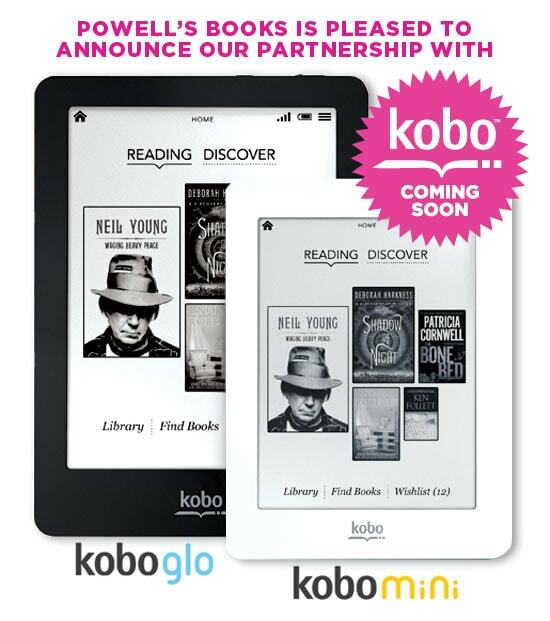 By signing on with Kobo they added to the credibility of the Kobo-ABA deal. Except you’ve also reported that that Kobo Glo demo units are filled with problems, so this helps Powell’s how? I recall they did layoffs within the past two years too. Once he’s created that account with your affiliation, you will receive a revenue share regardless of how he makes his way to the purchase. So, yes, you all received a revenue share for the purchase. We plan to distribute customer activity reports weekly. These reports are new to us (Friday, I think, was the first one) so we are messing with them a bit but soon, here, we’ll apprise you on a schedule of just this sort of thing. 1) to have a destination on teh Internets, which they won’t once Google pulls the plug. 2) an opportunity to turn e-buyers into people who buy books from your store. How you get #2 to happen is left as an exercise to the retailer, but things like “Pick up in store TODAY!” on a website order is a strategy even the mammoth retailers salivate at. This deal has the retailers pimping for Kobo for a measly affiliates fee. Yeah, that pays so little that it almost isn’t worth the time and effort. But what’s even worse is that at some point kobo will end the deal with the ABA. Kobo will keep all the device owners while the indies will keep – nothing. This is an awful lot of work that the indie booksellers will be throwing away, and the ones who cannot see it coming are fools. > This deal has the retailers pimping for Kobo for a measly affiliates fee. > Yeah, that pays so little that it almost isn’t worth the time and effort. The Google deal was MUCH more integrated, but in point of fact, all my credit card charges for Google e-books went to the ABA. So the ABA is kinda the pimp here and they’re trying to do something. To take some recent shopping examples, I was able to web-order and pick up in store the latest Colbert book (no 3-D glasses come with the e-book). Now, that has nothing to do with Kobo but Indiebound, who, inteestingly, seem super silent throughout this whole process. These stores need to keep offering physical goods on the web. A link to the Kobo site, which is (for now) Titcomb’s approach – complete dead end. My local indie had the ABA-supplied web infrastructure which permitted me to order Colbert’s mass-market book from a store which was never going to carry it on their shelves. At this point, we all know what Kobo is about and looks like. I’m now very interested in the future of indiebound and title integration with existing webstore fronts. As evil as Google got, the webstore for my local indie was managed by the ABA, and it was seamless whether I was getting from the store, the Indiebound affiliation, or Google (in terms of the shopping and searching, at least). Vage squawks were made about full website integration early on in the process, but if what you see on Titcomb – a URL witha couple parameters thrown on the end – is all they’re really talking about, well, screw that.